Few of us have a traditional (copper wire) phone service today. Leveraging the power of the internet to send data at high speeds, these days, we’re more likely to communicate via Voice over Internet Protocol, better known as VoIP. Consumers for over a decade have tended to dump landlines in favor of mobile phones en masse. However, some folks continue to have a landline whether for a home business, for better reception and less dropped calls, or a redundant backup so they can make a phone call while their battery hungry smartphone sits in the charger. There are plenty of options in the VoIP arena, with choices coming down to cost, support for other services such as e911, the required equipment, and your international calling needs. 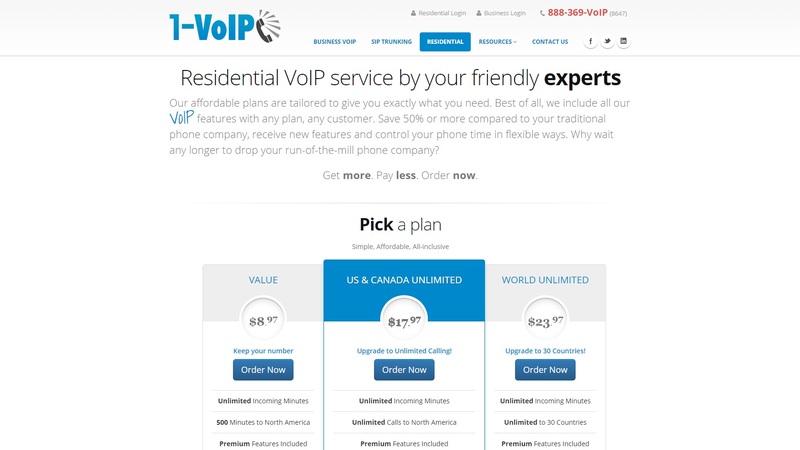 Let’s take a look at some handpicked choices for the best VoIP providers currently out there. 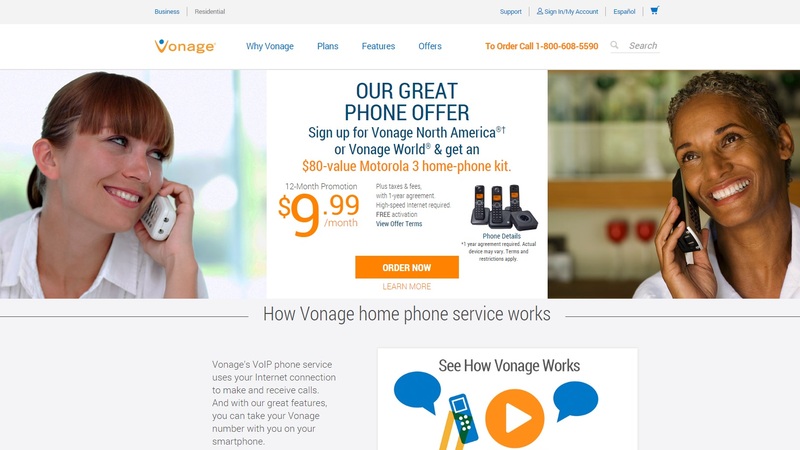 For those who are nervous giving up their copper phone line to head into this newfangled world of internet telephony, Vonage is a great choice, as they are quite well established, and offer a variety of plans to choose from, with plenty of support. Their lowest tier plan, Vonage US & Canada 400, starts at $12.99 (£10) per month, and offers a modest 400 minutes monthly for calling in the two countries mentioned in the plan’s name, with included free shipping and activation. The next tier up, Vonage North America includes unlimited calling to the US, Canada and Mexico, with a no-contract price of $24.99 (£19), which makes a good argument for the annual contract that brings it down to $9.99 (£8) per month with a 12 month commitment. The other benefit of the annual contract is that it includes the required hardware, known as a Vonage Box, for no additional charge. Ooma uses its box to provide a VoIP service, and offers an affordable option. They include such useful features as HD Voice for better voice quality, encrypted phone calls, prioritization of voice data on your network, and advanced voice compression to decrease bandwidth usage by 60% compared to other VoIP services. The basic box is the Ooma Telo, which is $99 (£76) and requires a wired connection. The upgraded box is the Ooma Telo Air, which costs $129 (£99), and allows wireless use. There are two tiers, Basic which is free except for the required monthly landline taxes, and Premier that costs $119.99 (£92) annually. While they both have unlimited calling, the higher tier includes such nifty features as Amazon Echo connectability, a mobile app for inbound and outbound calling, and call blocking. 1-VoIP is a value VoIP provider that offers a solid feature set at an affordable price, and the hardware is included. Their US & Canada Unlimited calling plan offers unlimited incoming and outgoing calls throughout North America at an affordable $17.97 (£14) per month, without requiring a monthly subscription, with the hardware included and no commitment. They also offer a lower budget tier that starts at $8.97 (£7) monthly, which has 500 outgoing minutes, but still offers unlimited incoming minutes, as well as the hardware and the same premium features of the higher tiers. The firm also provides a compelling premium feature set, that includes sending PDF documents as virtual faxes, voicemails that get forwarded via email as an audio attachment, automatic rejection of anonymous phone calls, and a digital softphone that allows you to use your service from a computer or smartphone via an app. 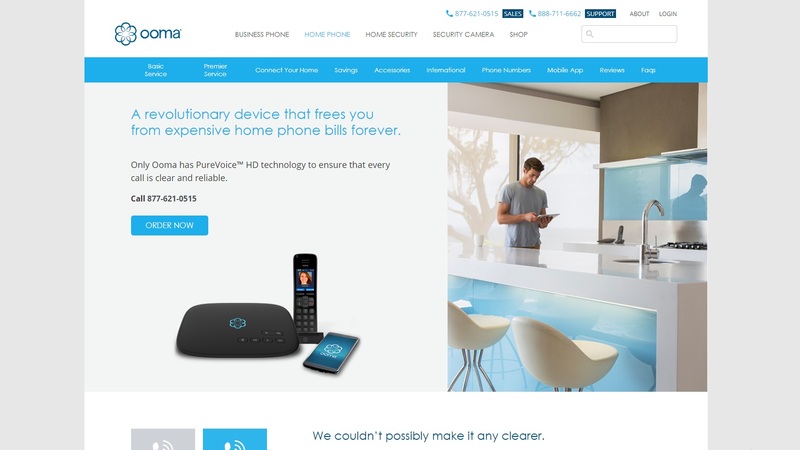 1-VoIP has also partnered with Normorobo to filter out those truly annoying telemarketers and robocalls. Lingo is solidly average across the board, but for your phone service that may be exactly what you are looking for, as their pricing is middle of the road, and so is the feature set. 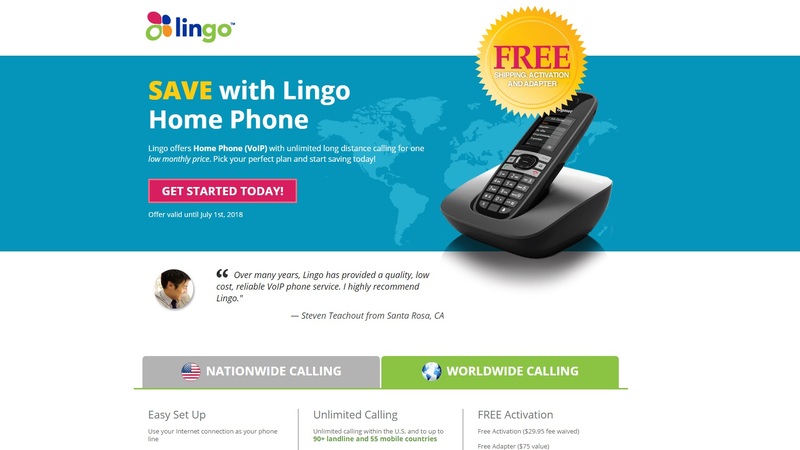 The Lingo Essential plan starts at $9.95 (£8) per month without a contract, plus a $1.99 (£2) 911 fee, which includes the adapter (and its shipping) plus 500 minutes for the month. The step up offering is the Lingo Unlimited plan that includes unlimited calling, and costs $19.95 (£15) per month without the contract, and $14.95 (£11) per month with an annual contract for those willing to commit to a year of service. Included in both plans are over twenty calling features. These include enhanced 911, anonymous call rejection, three-way calling and directory assistance. 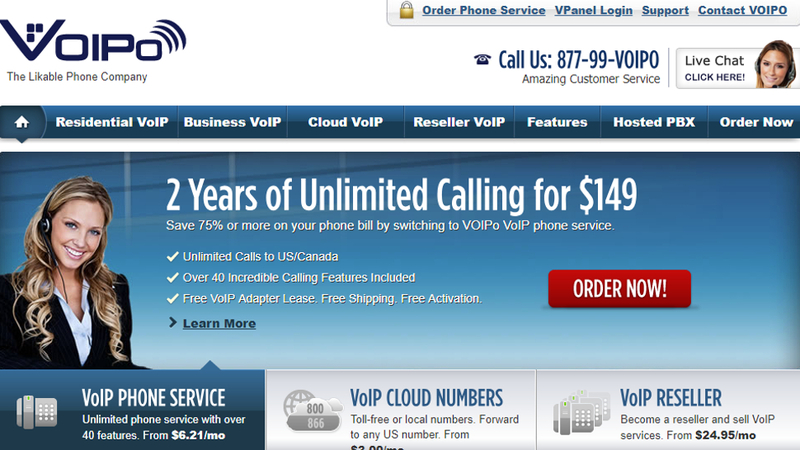 Taking the ‘price club’ approach to VoIP calling plans is Voipo. Rather than selling the service month-to-month, they sell it as a two year deal for $149 (£113), which then works out at a dirt cheap $6.21 (£4.70) per month, for an unlimited amount of minutes. For those that are commitment-phobic in terms of a longer contract, a 30-day money-back guarantee does offer reassurance. Sweetening the deal further are the 40 plus premium features, including online voicemail, telemarketer blocking, softphone access, a free rollover line, and even 60 minutes of included international calling monthly.